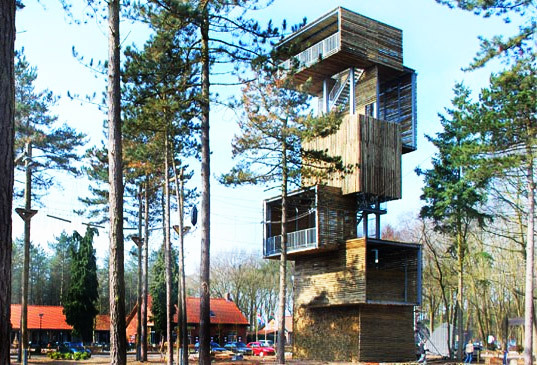 Boxy Wooden Treehouse Tower Now Open in Netherlands! We've seen plenty of tree houses in our day, but never one as boxy and modern as this new wooden observation tower which recently opened in the Netherlands. Okay so technically the structure, which consists of six boxes (that almost look like shipping containers) stacked atop one another, isn't a true tree house. But its natural cladding, made out of half logs from the area surrounding it, definitely help it blend in with its arboreal neighbors. And now that the boxy building by Ateliereen Architecten is finally open, people can scale its facade rock-climbing style, check out the views or even (for the more adventurous) try out its rope slide and high rope track. Standing at 25 meters high, the wooden tower is supported by a steel skeleton with staircases going up between and across the cubes. Only two of the six cubes are accessible, with the third one being the start platform for the rope slide and high rope track. In the top box, people can take in the scenery, or if they’re brave, try abseiling or rappelling. There is also an adjacent bistro if all of that physical activity makes you hungry. Can we get more specific information about the location? I love anything tree house! We are building tree houses on our Panama island property, Isla Palenque. They are not quite as boxy, a bit more integrated into the jungle, but then again our jungle is much denser than the forest pictured here. Incredible design though, very cool. Standing at 25 meters high, the wooden tower is supported by a steel skeleton with staircases going up between and across the cubes. Only two of the six cubes are accessible, with the third one being the start platform for the rope slide and high rope track. In the top box, people can take in the scenery, or if they're brave, try abseiling or rappelling. The site where the tower stands is a tree filled park in Reusal. 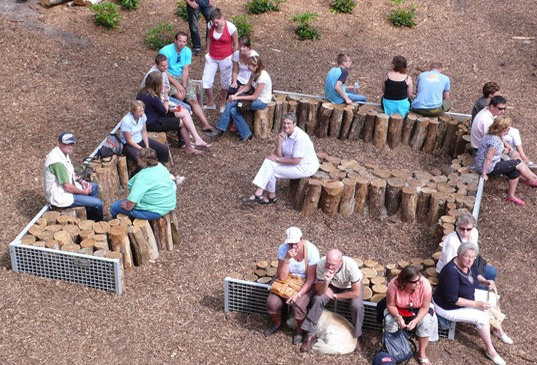 There is also an adjacent bistro if all of that physical activity makes you hungry and you can even rest at this lovely area made of the same logs that the tower uses. The tower is made from logs right from the park.